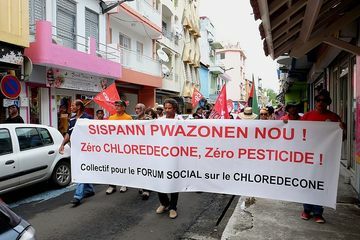 Almost all citizens from Guadeloupe and Martinique are contaminated by Chlordecone, a toxic pesticide used from 1972 to 1993 in the banana plantations. Today people are still asking for justice. The start of the 21st century was marked by the re-discovery of ecosystem pollution by chlordecone or kepone (an organochlorine molecule) used from 1972 to 1993 in the banana plantations against the weevil plague (a type of beetles) in the French West Indies (Martinique and Guadeloupe). Chlordecone used as a pesticide led to contamination that was long-lasting, generalized, and deleterious to public health. The pesticide has been recognized and signalled as harmful since the 1960s in the United States. 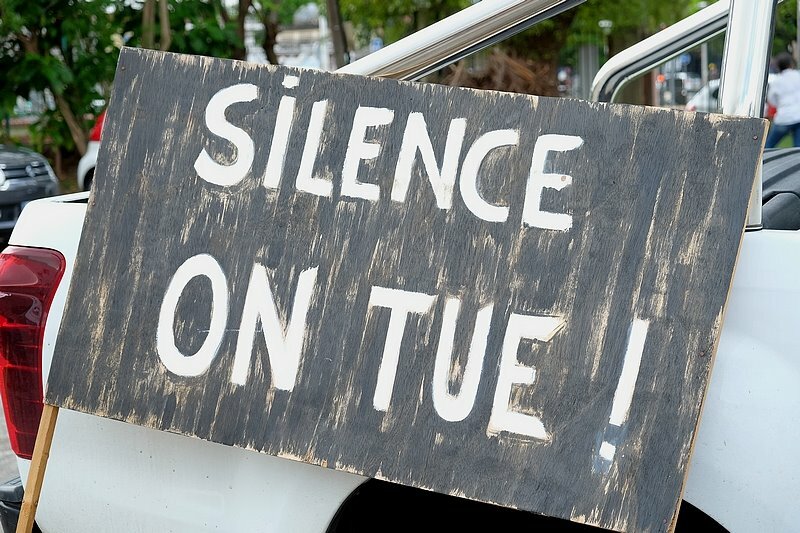 In 1990, it became forbidden in Metropolitan France but kept being used with impunity by the banana planters in Martinique and Guadeloupe until 1993. In 2009, Chlordecone was included in the Stockholm Convention on persistent organic pollutants, which bans its production and use worldwide, however, the health damage in humans and nature last until nowadays. According to Malcom Ferdinand (2015) around 300 tones of active substance were used between 1972 and 1993 on 12,400 hectares and 6,570 hectares of banana plantations in Martinique and Guadeloupe respectively. This means a total of 20,000 hectares of arable land. Moreover, there is no viable decontamination method found to date and this molecule is likely to remain in soils for many generations damaging present and future generations. According to INRA (Institut National de la Recherche Agronomique), 200 to 500 years would be needed to reduce pollution. Many scientific studies have shown the relation between the chemical and the risk of prostate cancer having Martinique and Guadeloupe some of the highest prostate cancer diagnosis rates in the world. Other health affectations are precocious pregnancies, specific impact on children (prenatal exposure through the placenta and post-natal exposure thought breastmilk and other nourishment). Also, the chemical has led to a “new disease” which local people have referred as “Kepone syndrome” to describe nervous system disorders of the such as tremors, loss of immediate memory and mood disorders. Other studies have shown scoliosis and nervous system damages in fish related to Kepone exposure. According to a survey (the Kannari survey), 92% of people tested in Martinique have chlordecone in their body and 19% of children tested exceed the toxic dose, other studies show that 90% of the Guadeloupeans are also contaminated. Since people realized their health affectations related to chlordecone, they began to ask for justice and monetary compensation through judicial activism but they have received no answer from authorities. 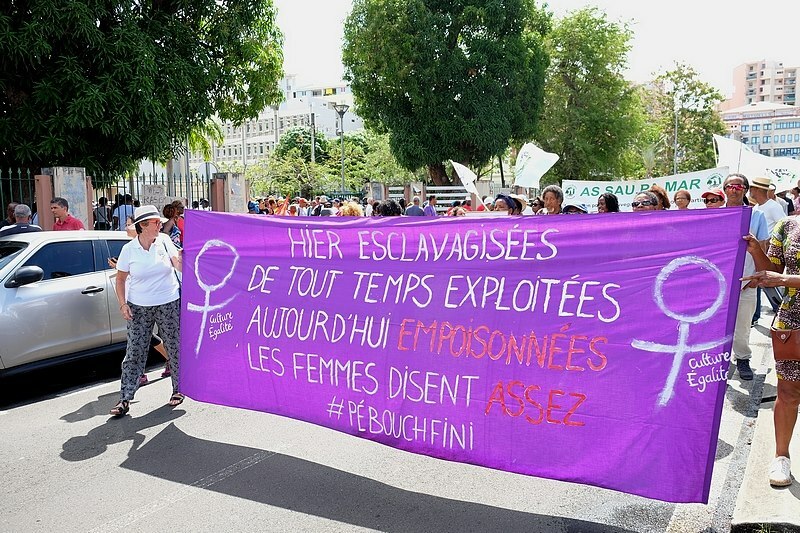 Many protests and public manifestations and campaigns have been taking place since then in both Martinique and Guadaloupe. Le début du xxie siècle fut marqué par l’apparition sur la scène publique de conflits concernant la pollution de ces îles par des pesticides. L’utilisation massive de pesticides et autres produits phytosanitaires au cours de la deuxième moitié du xxe siècle dans l’agriculture, et particulièrement dans les bananeraies, a engendré une importante contamination des terres et des eaux de ces îles avec de graves conséquences sur la santé des populations. Parmi les divers pesticides et molécules, l’utilisation du chloredécone (CLD) demeure vraisemblablement la plus préoccupante. Cette molécule organochlorée se présentait à travers ses formulations commerciales, le Képone® puis Curlone®, sous la forme d’une poudre blanche. Celle-ci était régulièrement épandue à la base des bananiers entre 1972 et 1993 afin de lutter contre le charançon Cosmopolites sordidus, un insecte ravageant les plants de bananiers à leurs bulbes. 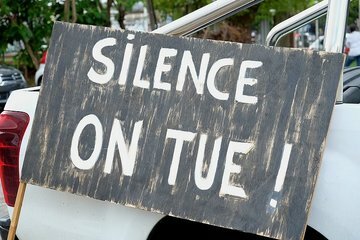 Aujourd’hui, plus de 25 % des terres agricoles de Martinique et de Guadeloupe sont contaminées par cette molécule classée comme cancérigène probable, pour une durée allant de soixante ans à sept siècles . De par sa forte rémanence et ses effets néfastes sur la santé publique, cette pollution constitue aujourd’hui un enjeu sanitaire public majeur dans ces départements. Project Details -Clordecone is an organochlorine compound and a colourless solid. It was used as a pesticide in banana plantation of Martinique and Guadeloupe from 1972 until 1993. As a highly persistent chemical in soil, it has been added to this of the Stockholm Convention of Persistant Organic Pollutants as of 2011. -Chlordecone was classified as a probable carcinogenic agent (2b) in 1979. It has been proven to increases the chances of prostate cancer. As a endocrine disruptor, this chemical delays cognitive development of infants. Environmental justice organisations and other supporters In Guadeloupe: SOS environnement Guadeloupe, Union régionale des consommateurs, Agriculture-santé-société-environnement; Syndicat Union des producteurs agricoles de la Guadeloupe; Comité de défense de l’eau en Guadeloupe. Other Specific impacts on men and children ; The chemical is cumulative in animal tissues affecting the whole alimentary chain. Usefulness of the land: Since 2003, local authorities have restricted cultivation of crops because the soil has been seriously contaminated by kepone. Why? Explain briefly. According to INRA (Institut National de la Recherche Agronomique), 200 to 500 years would be needed to reduce pollution. People in Martinique and Guadeloupe is dying from cancer and other diseases but no compensation has been given by the companies. Stockholm Convention on Persistent Organic Pollutants, 2011. Kepone-induced scoliosis and its histological consequences in fish.Science. 1977 Aug 5;197(4303):585-7. RAPPORT D’INFORMATION DÉPOSÉ en application de l’article 145 du Règlement PAR LA COMMISSION DES AFFAIRES ECONOMIQUES, DE L’ENVIRONNEMENT ET DU TERRITOIRE sur l’utilisation du chlordécone et des autres pesticides dans l’agriculture martiniquaise et guadeloupéenne. Cabidoche Y.-M. et al. (2009), « Long-term Pollution by Chlordecone of Tropical Volcanic Soils in the French West Indies: A Simple Leaching Model Accounts for Current Residue », Environmental Pollution, vol. 157, juin, p. 1697-1705. Perinatal exposure to chlordecone, thyroid hormone status and neurodevelopment in infants: the Timoun cohort study in Guadeloupe (French West Indies).Environ Res. 2015 Apr;138:271-8. doi: 10.1016/j.envres.2015.02.021. Epub 2015 Mar 3. Multigner L. et al. (2010), « Chlordecone Exposure and Risk of Prostate Cancer », Journal of Clinical Oncology, published online by American society of clinical oncology, June. Living in contaminated land: Struggle for an environmental justice in contemporary Martinique and Guadeloupe”, in Castillo, M. (ed. ), Heritage and Rights of Indigenous Peoples, Leiden, Leiden University Press, 2017, pp. 95-107.